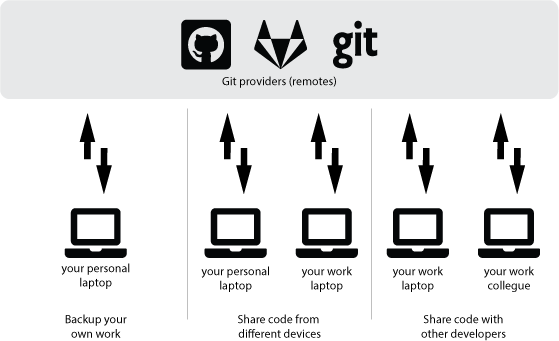 Git is a distributed source-control system and it can keep a copy of the entire repository in each device that you want or have permissions to. This way, it can help teams collaborating with the same source-code base. You can even use this feature if you just want to share your source-code between your personal and work computers or as a backup copy. Everytime that we have more than one repository (or copies from this repo), the one we are currently working on is known as the local repository and the other ones are called remotes. How to use remotes with Git and gmaster? In this section, we will cover how to use remotes with gmaster. This is one of the most relevant tasks if we think about collaborating over source-code. Why? Because this feature allows us to send and receive commits from the remote repo. Usually, when we deal with remotes, we need to authenticate with these servers. Git supports two modes: HTTPS and SSL. In HTTPS mode, we use our username and password. In SSL, we use a pair of public/private keys. A really nice feature of gmaster is we don't need to worry about usernames/passwords or keys. 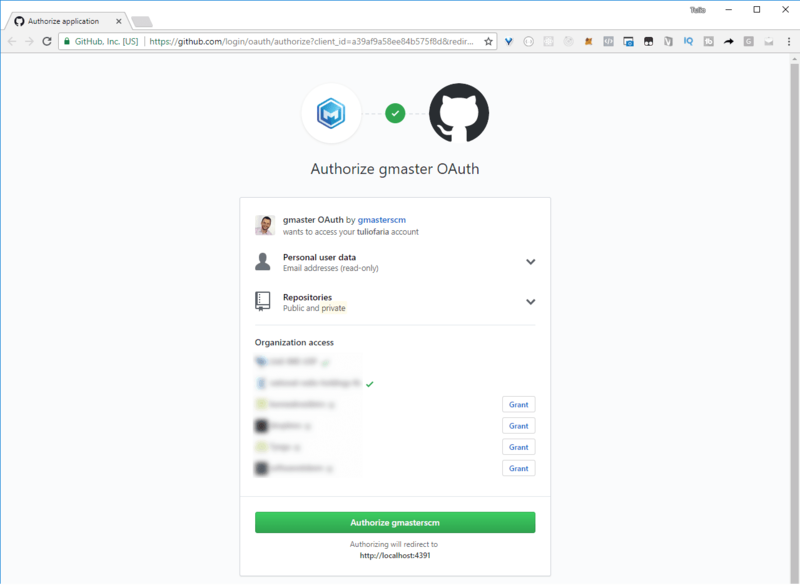 We just need to authorize gmaster to use our Github account in our browser - it's way easier. If the remote repository is public, (like all open-source repos in github), we just need to authenticate when we are sending or pushing changes to it. 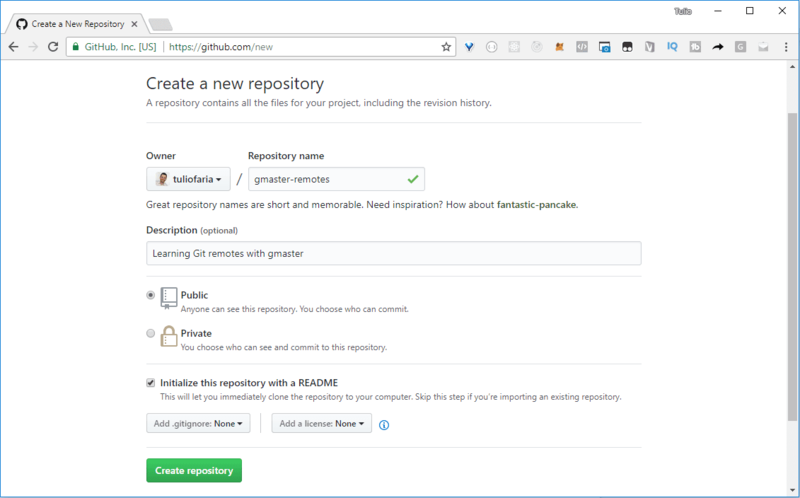 Let's create a new repository in Github. This way we can send our commits to a remote and even share the code with other developer friends. Just grant it by clicking "Authorize gmasterscm". Select your repo, for example our recently created repo gmaster-remotes, and click Clone repository. (You can choose where you want to keep the local version of this repo too). After cloning, we can click Open. Note that we are cloning the repo to our machine. So we are copying the entire repo from remote to our local machine. 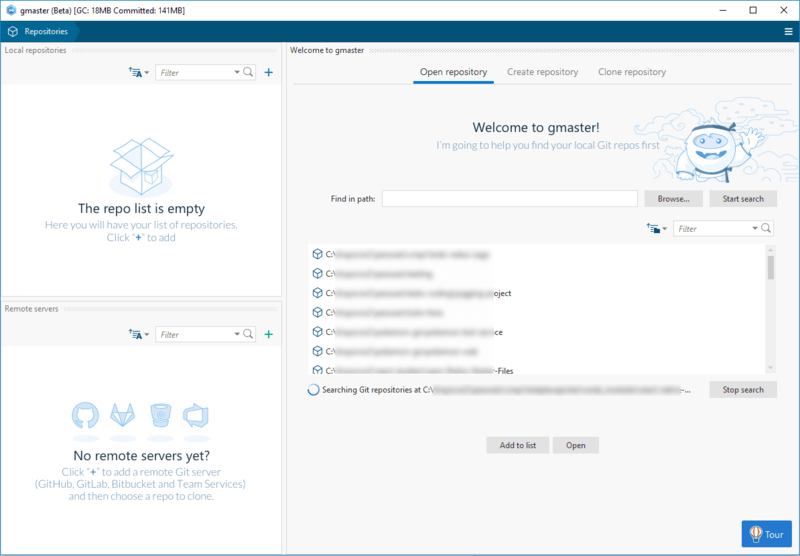 If we haven't created the repo first, we could do it now too inside gmaster, just heading to Create repository tab. Now we have the same screen that we covered in the last post: Branch Explorer, but with one difference - we have another indicator that shows the location of the origin/master. Origin is commonly used as the name of our first remote server. To see some changes going to the remote, I will change the README.md file locally and commit its changes. (We did this in our last post). Analyzing our Branch Explorer again, we can see that the master (local) is now ahead of the origin/master. Now, our local repo has the most recent updates and we need to send these to our remote. This operation is called "push". In gmaster, this operation is super easy too. We just need to click Push in our Branch Explorer screen. Notice, that now the Branch Explorer shows that the master local and origin is at the same point in time. 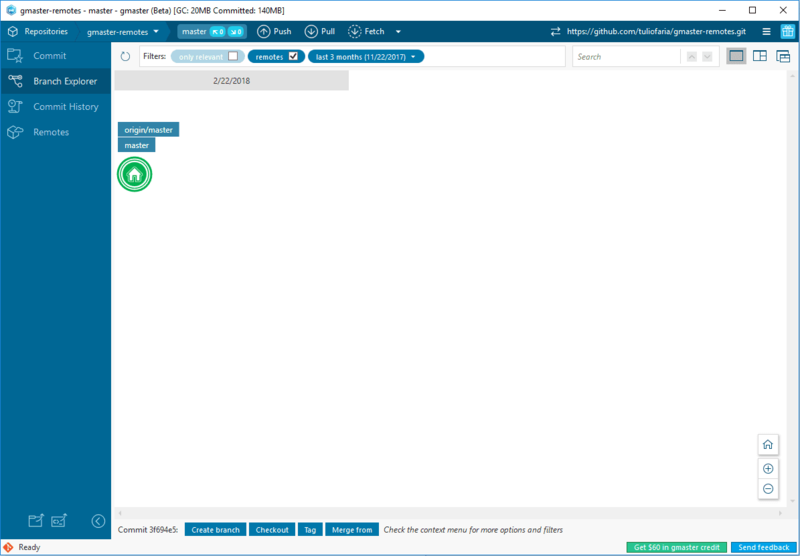 In Branch Explorer, click the Pull button. Now, we can see that we have one more commit on the screen. (The one we created directly in Github). Note: We changed the README.md in Github using the same user, but the process is the same if another developer from our team made the change. But what if I had a change in local and in remote? If before we pull the changes from the remote, we changed something in our local repo too, we need to merge those commits. This is easier because both repos (local and remote) have some commits in common. To test this, let's create a new commit in remote. (Using the same process we did before using the Github web interface). And, let's change and commit something locally too. Now, we have two commits that share the same parent commit but that are completely different. Let's pull the remote changes again. Here is where the magic really happens :) When we pulled the changes from the remote, git noticed that they share the same parent commit and considered it a new branch and already merged the changes back to the local commit. Wow! To finish the process, we just need to push to the remote again and both repos will share the same contents. But what if I had a conflict? This would be a breeze too. The only difference is that git/gmaster would not be able to auto merge it. We would need to fix the conflicts first and then commit our new merge. Now it's your time to try! Experiment using these processes on your own. You will notice that it is easy, and it will make you more confident in sharing code. 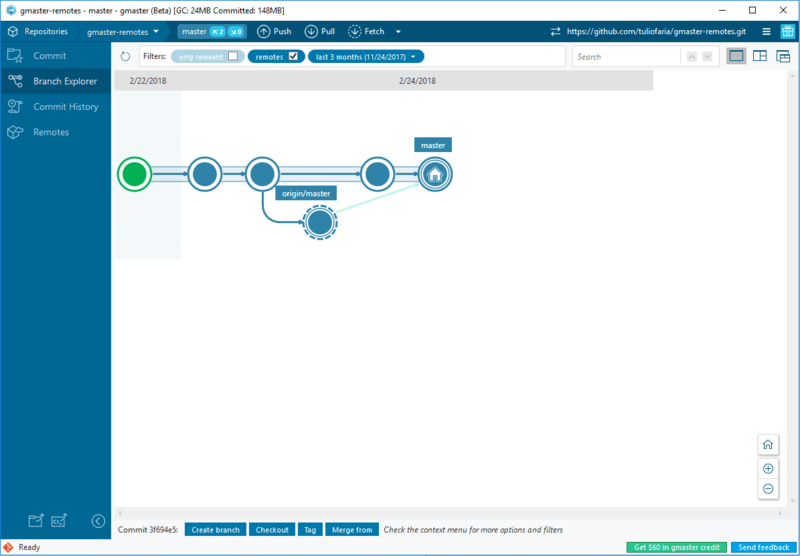 And, gmaster will make you feel even more confident by visually showing you how Git dealt with the changes. 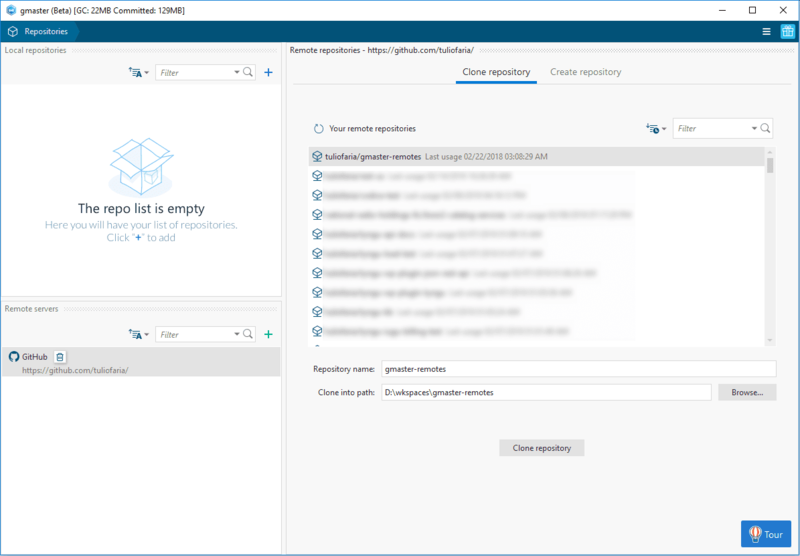 There seems to be no mechanism to access a private remote GIT repository? Not everyone uses public or commercial repositories! Right out of the install tried to pull repositories from private, surprised to see only some services there. Big let down, big one.